Nothing like a brand new toothbrush, but not just any toothbrush. 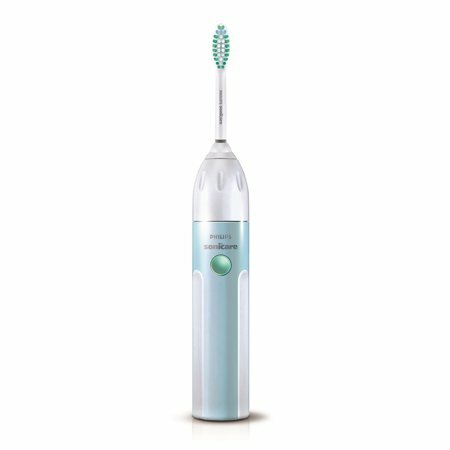 Head on over to Walmart to grab the deal on Philips Sonicare. Only $19.95, regularly priced $39.95 + Free Store Pickup. Taking care of your oral health is easy with the Philips Sonicare Essence 1 Series Rechargeable Sonic Toothbrush. It uses a powered motor to make it more convenient to reach all of the nooks and crannies in your mouth. This Philips rechargeable sonic toothbrush features a unique angled neck, extra-soft contoured bristles and patented Sonic technology to gently remove plaque. An easy-start feature helps you acclimate to the Sonicare experience by starting off at a lower speed. The Philips Sonicare rechargeable sonic toothbrush’s two-minute timer ensures that you brush adequately by keeping track for you. For further convenience, this model remains charged for up to two weeks, which is especially handy fopr when you’re traveling. When the bristles wear out the head is replaceable, and you can get extra heads so everyone in the house can use the same base (extras sold separately).